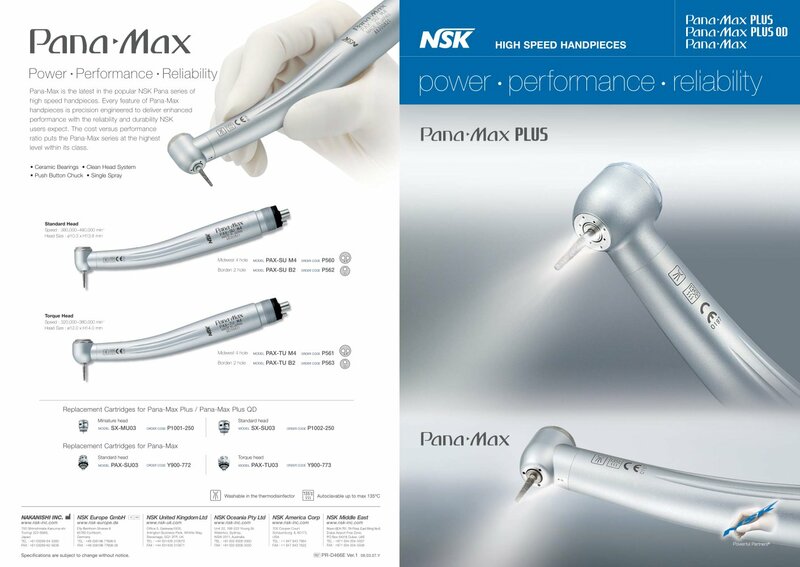 NSK Pana-Max air driven dental turbine/drill is a popular series of high speed handpieces developed with precision engineering to deliver enhanced performance with reliability and durability at a cost effective rate. The ceramic bearings are 25% harder than conventional steel bearings but are only half the weight providing better efficiency and durability compared with the steel alternative.The push button chuck provides tension to the bur grip during rotation and allows one-touch bur insertion and removal without the need for tools. Dependant upon the air outlet/s from your compressed air dental unit. The following documents offer more information about the NSK Pana Max 2 High Speed Turbine. Please download a copy for your reference.